Aims and Objectives: Bad breath has a significant impact on daily life of those who suffer from it. Oral malodor may rank only behind dental caries and periodontal disease as the cause of patient's visit to dentist. An aim of this study was to use a portable sulfide monitor as a motivational tool for encouraging the patients towards the better oral hygiene by correlating the plaque scores with sulfide monitor scores, and comparing the sulfide monitor scores before and after complete prophylaxis and 3 months after patient motivation. Materials and Methods : 30 patients with chronic periodontitis, having chief complaint of oral malodor participated in this study. At first visit, the plaque scores (P1) and sulfide monitor scores before (BCR1) and after complete oral prophylaxis (BCR2) were taken. Then the patients were motivated towards the better oral hygiene. After 3 months, plaque scores (P2) and sulfide monitor scores (BCR3) were recorded again. Statistical Analysis: It was done using SPSS (student package software for statistical analysis). Paired sample test was performed. Results: Statistically significant reduction in sulfide monitor scores was reported after the complete oral prophylaxis and 3 months after patient motivation. Plaque scores were significantly reduced after a period of 3 months. Plaque scores and breathchecker scores were positively correlated. Conclusion : An intensity of the oral malodor was positively correlated with the plaque scores. The portable sulfide monitor was efficacious in motivating the patients towards the better oral hygiene. Recently, a small, very handy and portable sulfide monitor has been introduced in the market under the name Tanita's breathchecker which is capable of detecting the volatile sulfur compounds in the breath. In Indian population, due to lack of an education and knowledge about an importance of oral hygiene, sometimes the oral hygiene is neglected. In this study, we tried to motivate the patients towards the better oral hygiene. This study has been conducted using Tanita's breathchecker as a motivational tool for encouraging the patients towards the better oral hygiene, by co-relating the oral hygiene status of the patients with breathchecker scores and comparing the breathchecker scores before and after the complete oral prophylaxis, thus motivating the patient towards the better oral hygiene. To correlate plaque scores (P1) and breathchecker scores (BCR1) at baseline. To compare the breathchecker scores before complete oral prophylaxis (BCR1) and after complete oral prophylaxis (BCR2). To compare breathchecker scores at baseline (BCR1) and 3 months after oral prophylaxis and patient motivation (BCR3). To motivate the patient towards the better oral hygiene. The patients having a chief complaint of bad breath and poor oral hygiene status. Patients having generalized chronic periodontitis. Patients not suffering from any systemic disease that can be a cause of oral malodor. Not on medication or antibiotic therapy that can be associated with oral malodor. Patients who have not undergone clinical oral prophylaxis procedure for at least one year. Patients not under any other clinical trial. A periodontal probe, mirror and tweezers. 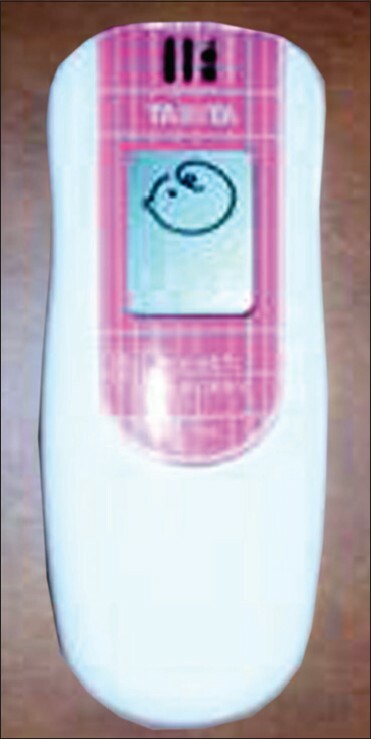 Tanita's breathchecker instrument (made in China) [Figure 1]. Figure 1: Showing breathchecker instrument. Breathchecker is capable of detecting volatile sulfur compounds. As the monitor of breathchecker is turned on, it emits a beep, when the second beep is heard, the patient is asked to blow air into the sensor. After the third beep, odor levels are displayed on the screen of the monitor [Figure 2]. Figure 2: Patient using breathchecker instrument. 0-No odor, 1 -Slight odor, 2 - Moderate odor, 3- Strong odor, 4-Very strong odor, 5-Intolerable odor. If no reading is displayed on the monitor, then it is considered as an error and the procedure is repeated again. At the first visit of the patient, complete case history of the patient was taken to include the patient in to study following the above mentioned criteria. Plaque scores (Silness and Loe, plaque index 1964) and breathchecker scores (BCR1) were also recorded using Tanita's breathchecker before oral prophylaxis as baseline data. After recording both, P1 (plaque score at baseline) and BCR1 (breathchecker score at base line), complete prophylaxis of the patient was done at the same visit. Complete oral prophylaxis included scaling and root planing and tongue cleaning. 30 minutes after the completion of the scaling procedure, the breathchecker scores were recorded again (BCR2). A slight reduction was observed in the BCR scores after the complete oral prophylaxis. Then we showed the pre and post prophylaxis readings to the patients, and motivated the patients towards the oral hygiene. Bass technique of tooth brushing was demonstrated to the patients. The patients were also given a demonstration of tongue cleaning. Patients were instructed to use Tanita's breathcheckers to monitor their breath odor on routine basis and maintain oral hygiene. Patients were evaluated after 1 month for oral hygiene status. After 3 months, plaques scores (P2) and breathchecker scores (BCR3) were taken again. All the data thus collected was put to statistical analysis. Statistical analysis: It was done using SPSS (student package software for statistical analysis). Paired sample test was performed to find paired difference of plaque scores and breathchecker scores at baseline and 3 months after. Correlation between plaque scores and breathchecker scores was evaluated using Pearson's correlation coefficient. Mean plaque score at baseline was 2.4+0.67, which was decreased to 0.51+0.25 after 3 months [Table 1]. An overall decrease of 1.88+0.72 was reported in plaque score in a period of 3 months, which was statistically significant [Table 2]. Mean breathchecker scores at baseline was 4.46+0.74, which was reduced to 3.2+0.56 after the complete oral prophylaxis [Table 1]. This change was statistically significant (P=0.001). Mean breathchecker score after 3 months was reported to be 1.2+0.41. An overall decrease of 3.2+0.79 was recorded from baseline to 3 months, which was statistically significant [Table 2]. Plaque scores and breathchecker scores were found to be positively correlated [Table 3]. Previous studies revealed sufficient information to conclude that, the major cause of bad breath is oral microflora that produces volatile odoriferous molecules. In this study, we have used a small portable sulfide monitor as a motivational tool, so that the patients can be encouraged towards the better oral hygiene and thus prevent periodontal disease and bad breath. The sulfidemonitor provided an objective reading that indicate the intensity of the volatile sulfur compounds. It was found that after the oral prophylaxis, there was reduction in the breathchecker scores. The mean value of the breathchecker scores at baseline (BCR1) was 4.4667, which was reduced to 3.2 after the complete oral prophylaxis (BCR2), and it was further reduced to 1.2 3 months after the patient motivation (BCR3) . This can be attributed to the reduction in the microbial load of the oral cavity and removal of the local factors that can perpetuate the oral malodor. After 3 months, the breathchecker scores were further significantly reduced, that can be considered as the effect of the patient's oral hygiene procedure that was instructed to the patients after the complete oral prophylaxis. It was interesting to notice that the reduction in the levels of breathchecker scores after patient motivation was far more significant than the reduction that occurred as a result of the complete oral prophylaxis. As when complete oral prophylaxis was performed, the breathchecker scores were taken just 30 minutes after the procedure, therefore, there was very little time interval for an alteration of the microflora of the oral cavity. However, when the patient maintained proper oral hygiene for next 3 months, significant alterations might have occurred in the oral microflora such as decrease in the periodontopathogens or may be an increase in the beneficial species which further resulted in the reduction in intensity of the oral malodor. But, to validate this assumption, further microbiological studies are indicated. Oral malodor is a subject of considerable public interest. Although many advances have occurred in the field of diagnosis of oral malodor, these scientific advances had not been stymied by lack of simplified instrumentation. But now, an introduction of Tanita's breathchecker has made the chair side assessment of oral malodor possible in no time; multiple patients can be examined at the same time and the variations in the oral malodor intensity before and after the complete oral prophylaxis can be shown to the patients in the clinic itself. Thus, the patients can be easily motivated towards the better oral hygiene by putting an emphasis on the role of poor oral hygiene in halitosis and periodontiits. 1. Klokkevold PR. Oral malodor: A periodontal perspective. J Calif Dent Assoc 1997;25:153-9. 2. Messadi DV. Oral and non oral sources of halitosis. J Calif Dent Assoc 1997;25:127-31. 3. Tonzetich J. Production and origin of oral malodor: A review of mechanisms and methods of analysis. J Periodontol 1997;48:13-20. 4. Kleinberg I, Westberg G. Oral malodor. Crit Rev Oral Biol Med 1990;1:247-59. 5. Persson S, Clarsson R. The capacity of subgingival microbiota to produce volatile sulfur compounds in human serum. J Oral Microbial Immunol 1989;4:169-72. 6. Waler S. On the transformation of sulfur containing aminoacid and peptides to volatile in human serum. Eur J Oral Sci 1997;105:534-7. 7. Tonzetich J. Oral malodor: An indicator of health status and oral cleanliness. Int Dent J 1978;28:309-19. 8. De Boever EH, Loesche WJ. Assessing the contribution of anaerobic microflora of tongue to oral malodor. JADA 1995;126:1384-93. 9. Morita M, Wang HL. Relationship of sulcular sulfide level and oral malodor. J Periodontol 2001;72:79-84. 10. Johnson PW, Yaegaki K, Tonzetich J. Effect of volatile thiole compounds on protein metabolism by human gingival fibroblasts. J Periodont Res 1992;27:553-67. 11. Ratcliff PA. The relationship between oral malodor, gingivitis and periodontitis: A review. J Periodontol 1999;70:485-9. 12. Mcnamara TF, Alexander JF, Lee M. The role of microorganisms in production of oral malodor. Oral Surg 1972;34:41-8. 13. Persson S, Edlund MB, Carlsson J. The formation of hydrogen sulfide and methyl mercaptan by oral bacteria. J Oral Microbial Immunol 1990;5:195-201. 14. Yaegaki K, Sarada K. Biochemical and clinical factors influencing oral malodor in periodontal patients. J Periodontol 1992;63:783-9. 15. Johnson PW, Tonzetich J. Solublization of acid soluble collagen by hydrogen sulfide. J Dent Res 1979;58:283. 16. Ng W, Tonzetich J. Effect of hydrogen sulfide and methyl mercaptan on permeability of oral mucosa. J Dent Res 1984;63:994-7. 17. Johnson PW, Tonzitich J. Effects of hydrogen sulfide on protein synthesis by gingival fibroblasts. J Dent Res 1982;260:(Abstract 736). 18. Tonzetich J, Page RC. Suppression of DNA synthesis of human fibroblast by hydrogen sulfide. J Dent Res 1982;61:260. 19. Attia EZ, Marshall KG. Halitosis. Can Med Assoc J 1982;126:1281-5. 20. Rosenberg M, McCulloh CA. Measurement of oral malodor: Current methods and future prospects. J Periodontol 1992;63:776. 21. Newman MG, Takei HH, Carranza FA, editors. Carranza's Clinical Periodontology Missouri: Elsevier; 2006. 22. Lu DP. Halitosis: An etiologic classification: A treatment approach and prevention. Oral Surg 1992;54:521-6. 23. Bosy A, Kulkarni GV, Rosenberg M. Relationship of oral malodor to periodontitis: Evidence of independence in discrete subpopulations. J Periodontol 1994;65:37-46. 24. Yaegaki K. Volatile sulfur compounds in mouth air from clinically healthy subjects and patients with periodontal disease. J Periodont Res 1992;27:233-8. 25. Tonzetich: Reduction of oral malodor by oral cleansing procedures. Oral Surg Oral Med Oral Path 1976;42:172-6. 26. Schmidt NF, Missan SR, Tarbet WJ. The correlation between organoleptic mouth odor ratings and level of volatile sulfur compounds. Oral Surg Oral Med Oral Path 1978;45:561-7. Arabaci, T. and Demir, T.